I've been dying to go to Village Ice Cream for a try ever since I've first heard of their salted caramel flavour, but the weather was not cooperating and as a result people were seldom in the mood for a cold treat. Luckily a few weeks ago, the weather improved and over a debate that I won, I found myself at Village Ice Cream for the first time. 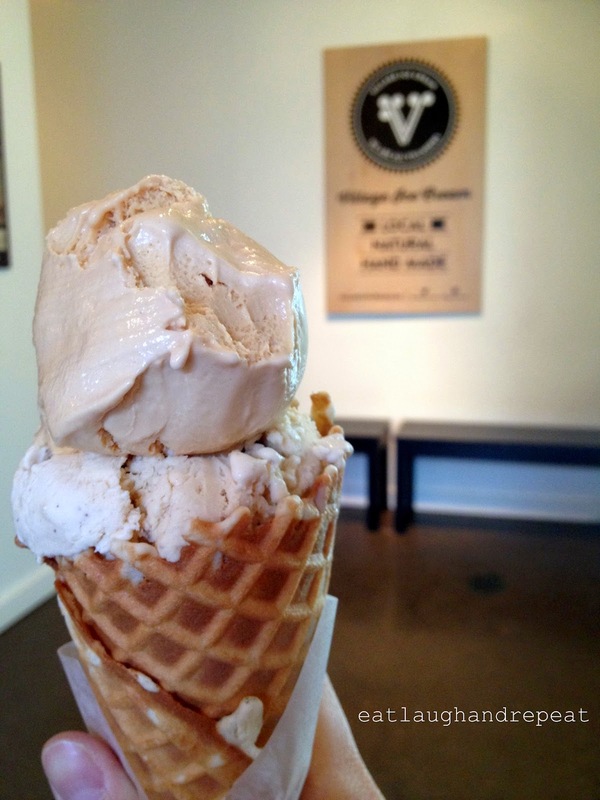 Village Ice Cream is a local ice cream shop that crafts their own ice cream. With ten permanent flavours in store and additional seasonal specials, there's enough variety to adhere to your preference, but limited enough to ensure that Village Ice Cream can specialize in all the flavours that they offer. When I walked into the store, the smell of freshly made waffles that filled the room hit me. Generally, I'm not too crazy about waffle cones or cones in that matter, I'm more of a scoop of ice cream in a cup kind of girl, but the smell of the waffles was enough to persuade me to order a waffle cone. I arrived at Village Ice Cream knowing that I was going to try the long awaited salted caramel, but when I saw that they also had a Phil and Sebastian Coffee flavour, it put me in a rut. In the end, I ended up getting one scoop of each so that I could try both despite feeling full from dinner beforehand. I'm glad I got both though, because the salted caramel ended up being a little too much for me - I felt like the taste was too strong and heavy for the whole scoop. On the other hand, the Phil & Sebastian Coffee helped tone down the salted caramel. Rich flavourful ice cream and delicious waffle cones. This will be one of my favourite destinations for the summer. Though a fair warning, I will admit that this place is a bit expensive for a ice cream shop.